Is a powerful set of tools to help grow your business. Can assist every functional area of the business. Must be an integral part of the company’s business plan. Plan is an extension of the company’s business plan. As a key element, must be effective. Can be produced and delivered, on-time, and on-budget. We design and develop websites into dynamic business functionality tools. Every webpage is a reflection of your company. Our role is to facilitate the effective communication of Your message to Your customers. Your customers include, paying customers, employees, shareholders, vendors, and all groups and individuals that contribute to, and are served by Your website. We are dedicated to helping you provide a positive experience for all of these stakeholder groups. IRCUSA is responsible for the continued effectiveness of Your website by providing Promotion, Hosting, and Management Services to update and upgrade Your systems. Making Your Online presence meet your expectations? 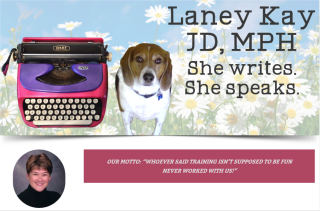 Ensuring that your Web site performs like you had hoped? You need to answer some tough questions before getting your web team started. Here goes. Do you have an online strategy? Have you documented how that strategy will integrate with your off-line strategy? Does the budget match your desired return on your planned investment? Does a creative strategy exist for your company? What is your objective for the site? What is the site's target market? If you are already operating an off-line business, do you have an inventory of all your systems and processes? Who will access the site from within the company, and how? Where will you house your site--will it be self-hosted or at IRCUSA? What are your Web security needs? Are there any legal considerations? What are your marketing plans? Or how will you get the word out? Enter-Sports Management provides on-scene player support and career marketing for professional football players to world sponsors. uses IRCUSA's Business Web Management for successfully marketing affordable high quality church furnishings to churches nation wide. 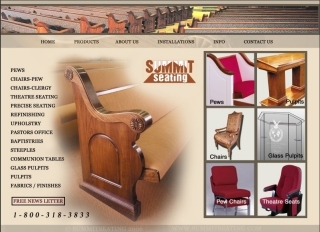 Their new web layout needed a virtual buyer catalog of solid wood pews, chairs, pulpits and glass tables. This site design is unique in its support for the worship sanctuary and church furniture industry. uses IRCUSA's Small City Web Management for new web services to citizens like online forms, service email, event calendars, weather portals, council minutes, photo gallery's and signup for parks and recreation activities. 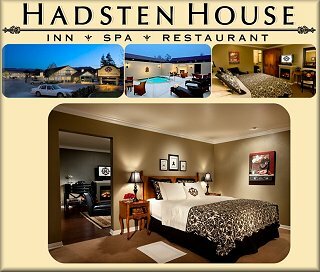 Hadsten House stands for quality and value when you visit California's Central Coast wine country. Partnership with local vintners provide unique value and free tastings and over 20 top wineries. This high quality inn and spa has a powerful presence online and a sought out newsletter for specal wine country values. Look for this site to set the pace in the travel industry. Call Hadsten House' Mike Hawke to learn why their hotel found IRCUSA services to help them become more profitable and to better focus on what they do best, make great vacations. Visit Hadsten House Inn online.